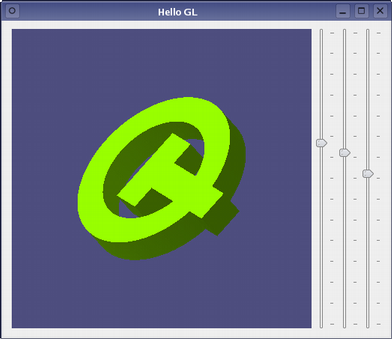 The Hello GL example demonstrates the basic use of the OpenGL-related classes provided with Qt. Qt provides the QGLWidget class to enable OpenGL graphics to be rendered within a standard application user interface. By subclassing this class, and providing reimplementations of event handler functions, 3D scenes can be displayed on widgets that can be placed in layouts, connected to other objects using signals and slots, and manipulated like any other widget. We use a destructor to ensure that any OpenGL-specific data structures are deleted when the widget is no longer needed. The signals and slots are used to allow other objects to interact with the 3D scene. OpenGL initialization, viewport resizing, and painting are handled by reimplementing the QGLWidget::initializeGL(), QGLWidget::resizeGL(), and QGLWidget::paintGL() handler functions. To enable the user to interact directly with the scene using the mouse, we reimplement QWidget::mousePressEvent() and QWidget::mouseMoveEvent(). The rest of the class contains utility functions and variables that are used to construct and hold orientation information for the scene. The object variable will be used to hold an identifier for an OpenGL display list. In this example, we split the class into groups of functions and describe them separately. This helps to illustrate the differences between subclasses of native widgets (such as QWidget and QFrame) and QGLWidget subclasses. The constructor provides default rotation angles for the scene, initializes the variable used for the display list, and sets up some colors for later use. The destructor ensures that the display list is deleted properly. In the above slot, the xRot variable is updated only if the new angle is different to the old one, the xRotationChanged() signals is emitted to allow other components to be updated, and the widget's updateGL() handler function is called. The setYRotation() and setZRotation() slots perform the same task for rotations measured by the yRot and zRot variables. The initializeGL() function is used to perform useful initialization tasks that are needed to render the 3D scene. These often involve defining colors and materials, enabling and disabling certain rendering flags, and setting other properties used to customize the rendering process. The resizeGL() function is used to ensure that the OpenGL implementation renders the scene onto a viewport that matches the size of the widget, using the correct transformation from 3D coordinates to 2D viewport coordinates. A discussion of the projection transformation used is outside the scope of this example. Please consult the OpenGL reference documentation for an explanation of projection matrices. In this example, we clear the widget using the background color that we defined in the initializeGL() function, set up the frame of reference for the object we want to display, and call the display list containing the rendering commands for the object. Just as in subclasses of native widgets, mouse events are handled by reimplementing functions such as QWidget::mousePressEvent() and QWidget::mouseMoveEvent(). Since the user is expected to hold down the mouse button and drag the cursor to rotate the object, the cursor's position is updated every time a move event is received. We have omitted the utility functions, makeObject(), quad(), extrude(), and normalizeAngle() from our discussion. These can be viewed in the quoted source for glwidget.cpp via the link at the start of this document. In addition, it contains sliders that are used to change the orientation of the object in the scene. The constructor constructs an instance of the GLWidget class and some sliders to manipulate its contents. We connect the valueChanged() signal from each of the sliders to the appropriate slots in glWidget. This allows the user to change the orientation of the object by dragging the sliders. We also connect the xRotationChanged(), yRotationChanged(), and zRotationChanged() signals from glWidget to the setValue() slots in the corresponding sliders. The sliders are placed horizontally in a layout alongside the GLWidget, and initialized with suitable default values. The GLWidget class implementation shows how to subclass QGLWidget for the purposes of rendering a 3D scene using OpenGL calls. Since QGLWidget is a subclass of QWidget, subclasses of QGLWidget can be placed in layouts and provide interactive features just like normal custom widgets. QGLWidget::initializeGL() sets up resources needed by the OpenGL implementation to render the scene. QGLWidget::resizeGL() resizes the viewport so that the rendered scene fits onto the widget, and sets up a projection matrix to map 3D coordinates to 2D viewport coordinates. QGLWidget::paintGL() performs painting operations using OpenGL calls. Since QGLWidget is a subclass of QWidget, it can also be used as a normal paint device, allowing 2D graphics to be drawn with QPainter. This use of QGLWidget is discussed in the 2D Painting example. More advanced users may want to paint over parts of a scene rendered using OpenGL. QGLWidget allows pure OpenGL rendering to be mixed with QPainter calls, but care must be taken to maintain the state of the OpenGL implementation. See the Overpainting example for more information.